We are small kennel in the heart of Germany, founded 1998. The Australian Cattle Dog is an important part of our lives since 1993. 15 years ACDs gives us experience in training, showing, breeding and living with these dogs. Our dogs have won many show and working titles since the foundation of our kennel. Many breeders in europe trace their lines to our dogs, which makes us very happy. Over the past we have exported dogs to the US, Sweden, Finland, France, Netherlands, Belgium, Denmark, Russia, Estonia, Austria and Switzerland. Our old girl Dusty Dingo holds 14 working Champion titles and is the first Australian Cattle Dog who gained the title German Veteran Champion (showtitle). Our lines are founded on australian and american lines and we combine excellent character, extraordinary working ability and show quality in our dogs. Trainer & owner of Dusty Dingo SchH I, AD, BH (Austr. Imp.) 14 times working Ch. 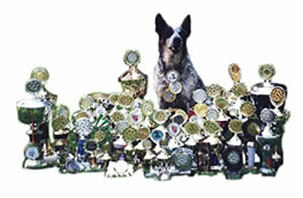 Breeder of several working titled dogs, that compete in obedience, Schutzhund, SAR, Agility and more all over the world. Please note that this site is still under construction and many pages do not work yet as they should. Please feel free to come back often and see how our site grows and takes shape. In the meantime feel free to look around and discover more about us and our dogs.